Just one item that has kept me away from my Otter builds. 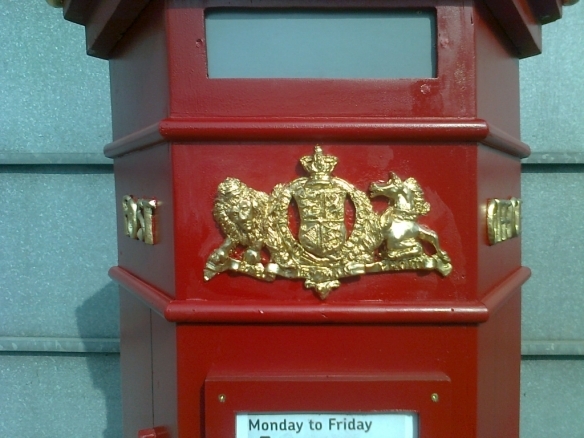 The Penfold Pillar-Box Replicas. Made by me. 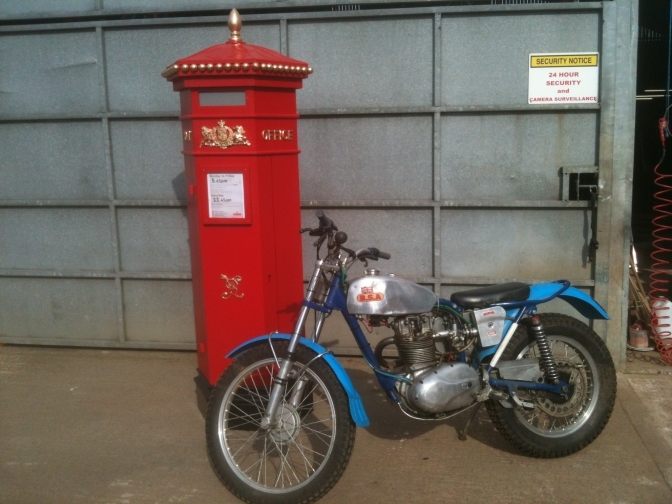 An explanation for putting this on to a BSA motorcycle trials site. Well this is just one of the items, that has kept me away from my beloved “Otter “trials bikes” for the past four months. I might add that it has been really good fun! Most of the time, and a once in a lifetime experience, so I shouldn’t grumble should I? There have been times when the materials required did not turn up on time, which made the job a lot more difficult to achieve in the time scale, and, unfortunately my brother does nothing! Until the last minuet, the same as the entire event build trade do? I am told. 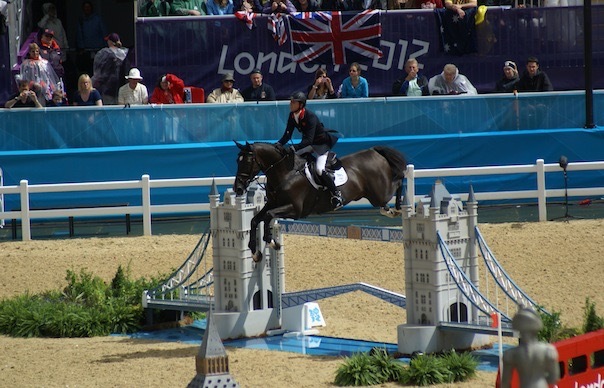 This page will eventually link to another web site, which should explain the full drama of the build of the London Olympic show jumping elements. It now means I can get back to the thing I love most? 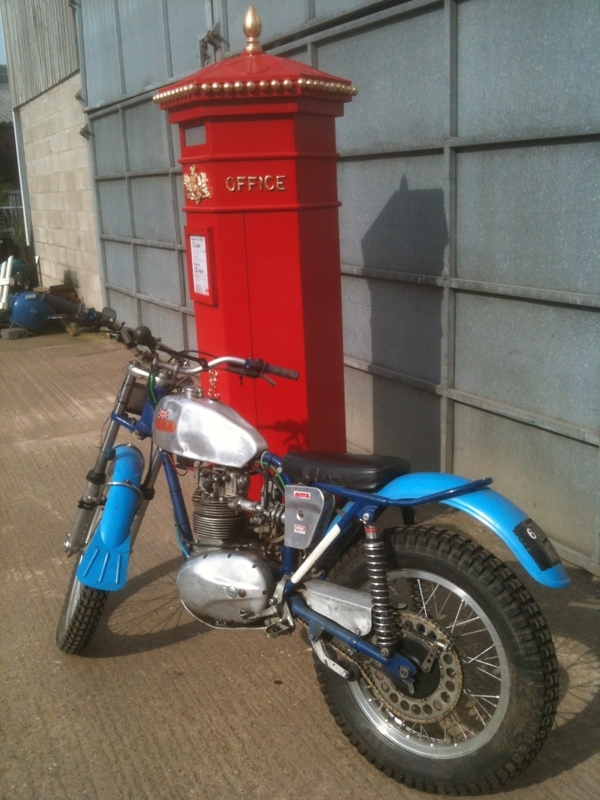 Classic trials bikes and especially BSA “Otter’s”. The little dog's name is Winnie, and she is my true companion.. And looks good with the Red-White and Blue. Good luck to our,team, and all other's competing in the 2012 games. OK The first of August,2012, and It looks like the "Penfold Pillarboxes" are now famous? Front page picture and all that. just need the same thing to happen to the BSA"Otter". Here is one of the pictures that is said to have robbed Britain of a Gold Medal. 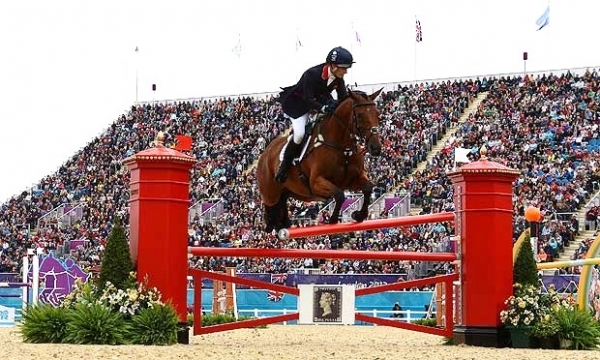 Zara Phillips should not be blamed! I knew those poles were bad news! when the paint pickled twice, when I lacquered them.Just not enough time to have done the jobs in the proper time scale. The Penny Black Stamp filler had to be repainted after I got over-spray from another fence I was spraying with polyester onto it, because it had not been moved like I asked it to be. The balls around the top of the pillar boxes are 35mm wooden beads, and the finials ,I turned from 4"x4" spruce. The coat of arms and the cypher along with the lettering were modelled by me in Polyclay,firstly. This took over two weeks four hours every morning to get to my satisfaction. Then these were baked in an oven slowly for an hour and left to cure for a day, before an RTV silicone mould was taken from them. This then had to be left to cure for a couple of days. Then they were cast in polyester resin, and again left to cure before being fixed to the wooden structure with mastic adhesive. Finally after the boxes had been sprayed with post-office red paint and then lacquered. I could finally gild the coat-of-arms and the rest of the furniture, has we call it,with the the special gold paint that I sourced. I did enjoy creating this coat-of-arms and with the detail that was probably over the top and waisted on the Horsey types. But I did it to my satisfaction and not there's. I will now be doing more sculpture work to suit myself. All Photo Credits "Otterman" 2010. OK an unexpected update to this subject ,but a vital one. Just a word of warning about using anything to do with the Olympic committee copyright. Be so afraid if you use anything with those ring on or anything that starts with the word!! You may be sued for more than a fortune, and when you thought you were helping your country's sport , you were actually jeopardising your future, by portraying images of a sporting institute, so be careful what you put onto a plain green field! I have put these images of my "Penfold Pillarboxes", onto this site so I still have references to them? Well for some inexplicable reason these pair of boxes have now been sold to Millstreet in Ireland? Why would they want a pair of RED pillar-boxes there? The proper cast iron working "Penfold Pillar-Box" that they have there has just been restored. and repainted green as it ,or they, always were in Ireland, and on there box the Royal Coat of arms had been removed. but the VR cypher remains. 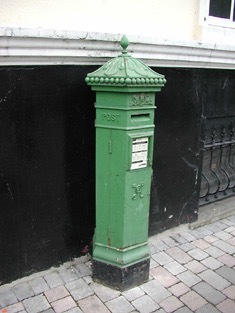 Green Box from Ireland. here when I find it . Here is a "Penfold Pillarbox" in County Wexford Ireland. This one still has the coat of arms although it is just painted over . 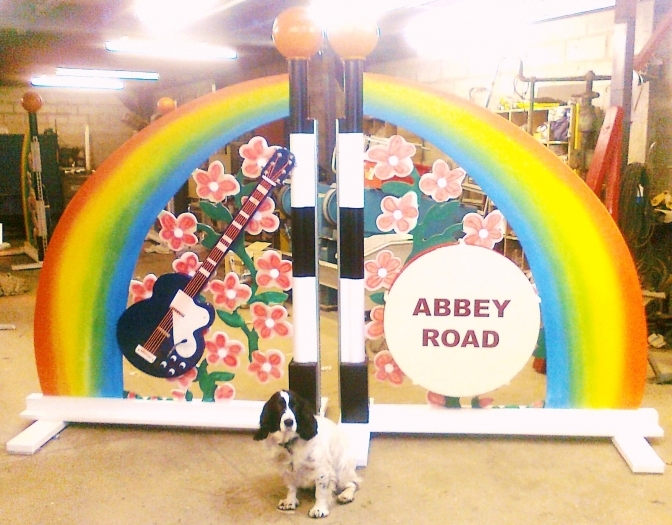 Replicas, of the Abbey Road fence used for the London Olympic show. Very popular, along with the other two London Tower Bridge fences that we built and I painted. In the cold of winter. Just another little job I did for the the showjumping industry. Baaaaaa. This is the Tower Bridge Fence. This Superb work of art was built by Paul Ellis, and painted by Lyn Hawes and me. Another two Replicas were built by Paul and painted by Lyn and I for other customers. I developed a stone textured finish for this fence that made it look more realistic. The top of "Big Ben" is just visible in this shot. I spend five full days air-brushing this and the houses of parliment.along with turning the turets on the old wood lathe. If you want to look at a proper Penfold Pillarbox there are several in Cheltenham still being used and others dotted about the country. And one in particular at the "Black Country" Museum. 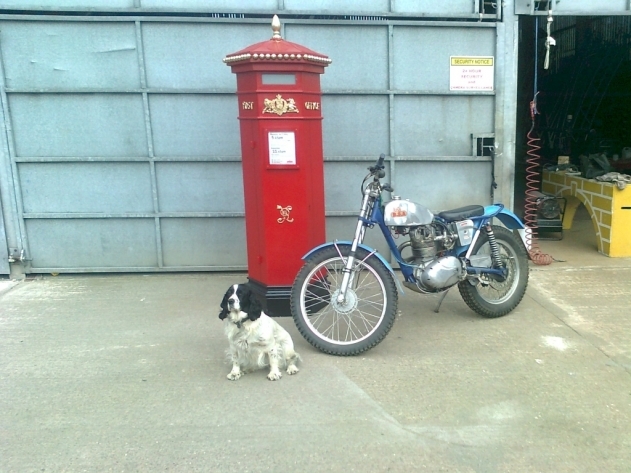 Coincidental the BSA C15T was rebuilt to this specification in Gloucestershire. and purchased from a company in Cheltenham. and even the BSA tank badge joined in the colour theme.